DATE: 23th Jan 2014 - 28th Jan 2014. ACARA: 4 EMAS (Individu dan Berpasukan. Wakil Teknikal MCF menghadiri Mesyuarat Pelarasan Bersama Sukan kebangsaan (PSK) SUKIPT 2014 Bil 4 di INTEKMA Resort & Convention Centre , Shah Alam Selangor pada 11-12 Jan 2014. Closing Date: 25 February 2014. 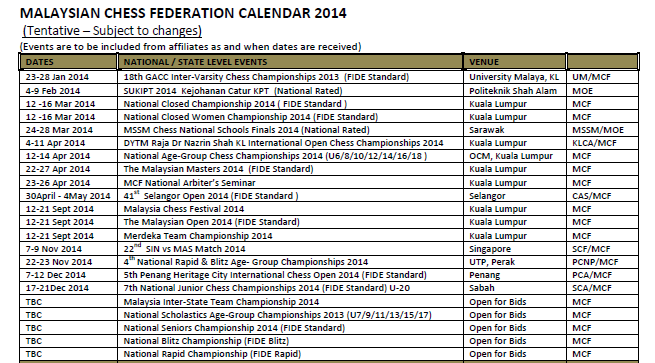 The player must not have a published FIDE Rating of 2000 or greater for at least 2 years prior to 01 January 2014. They must not hold any title above CM (WCM). 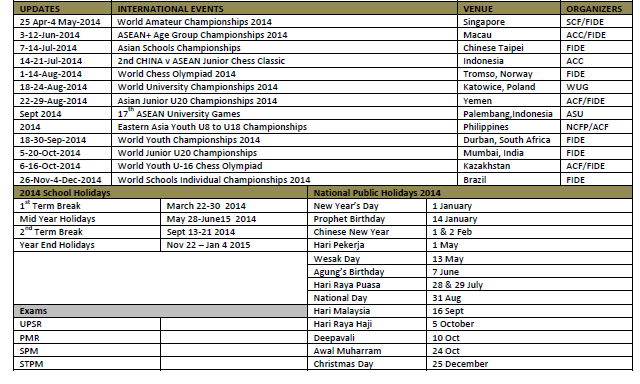 The World Amateur Championship is open to players registered by their Federation. Open (€ 5,000) : 1,500; 1,000; 700; 450; 350; 300; 250; 200; 150 and 100. Women (€ 2,500) : 1000; 750; 400; 250 and100. (subject to Rule 2.2 and depending on the number of entries if below 8). All payment must be direct to SCF Organizer.